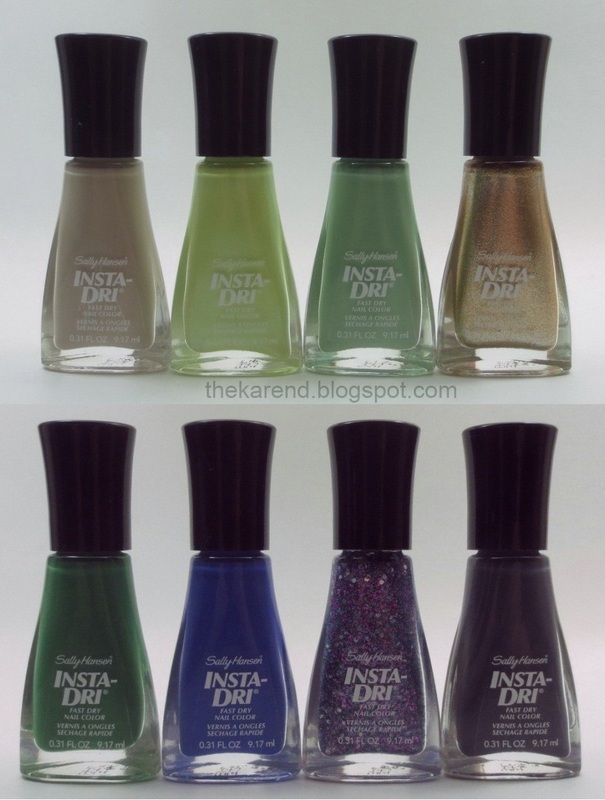 In last week's display post, I shared the latest Sally Hansen Insta Dri display with eight "new" shades. Today I've got all eight on my nails, though I didn't have the time or attention span to do full hand swatches of all the colors. Top row below: Sand Storm, Chartreuse Chase, Jade Jump, and Go for Gold. Bottom row: I-rush Luck, In Prompt Blue, Grape Shifter, and Grease Lightening. Jade Jump is not new; the first time I saw it was in a limited edition display in Spring 2011. I don't know if it disappeared between then and now, since I can barely keep track of seasonal displays much less core ones. I suppose I should be glad they didn't give this mint green creme a new name for this new display (I guess they didn't have to in order to get me to buy an new bottle, since I grabbed first and researched later). 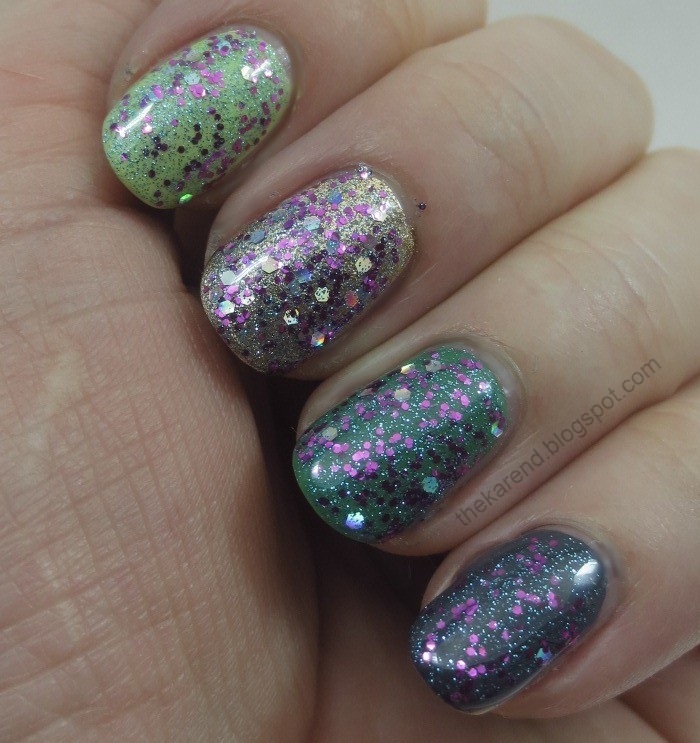 I paired Jade Jump with an accent nail of Go for Gold, a gold metallic that is new as far as I know. Both of these colors were two coats. I liked this combination of green and gold so much I added funky French tips just so I could enjoy it for a little while longer before I moved on to the next set of swatches. I Skittle swatched Sand Storm (neutral tan creme), Chartreuse Chase (acid yellow green shimmer), I-rush Luck (green creme), and Grease Lightening (dark grey creme, which I think should be called Greased Lightning, but maybe if they did that, they'd have to pay the creators of Grease the musical). All but Chartreuse Chase are new shades, as far as I know; Chartreuse Chase was part of the same 2011 limited edition collection as Jade Jump. Despite already owning Chartreuse Chase, I didn't realize it was a shimmer until I pulled the brush out of the bottle. I used two coats of all but Chartreuse Chase, for which I needed three; I might have been able to get away with one of Grease Lightening. 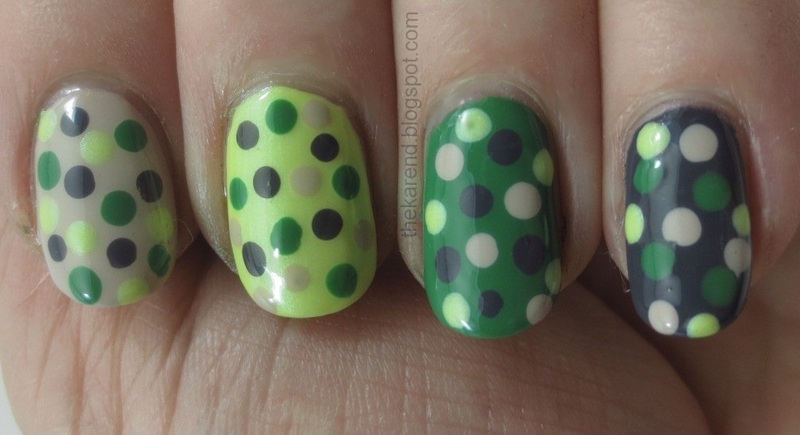 I wouldn't wear these four colors together as plain Skittles, so I experimented with adding dots to try and tie them together into a look I would do for a full mani. Each base color got dotted with the other three in the group, then I added topcoat to smooth things over. It's a little busy and makes me think of dinosaur Easter eggs for some reason, but I can think of a few outfits I have that this would add a nice accent to. In Prompt Blue is a new shade, a vibrant blue creme, and another two-coater. It's pretty shiny even without topcoat. Finally, it was time to try Grape Shifter, the only glitter in the collection. 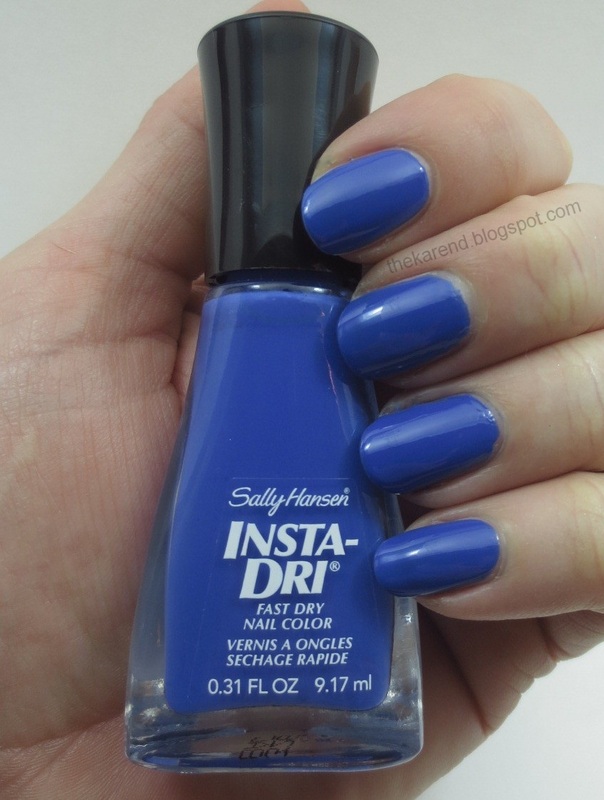 This is definitely a new shade; I would have remembered if I had it already. 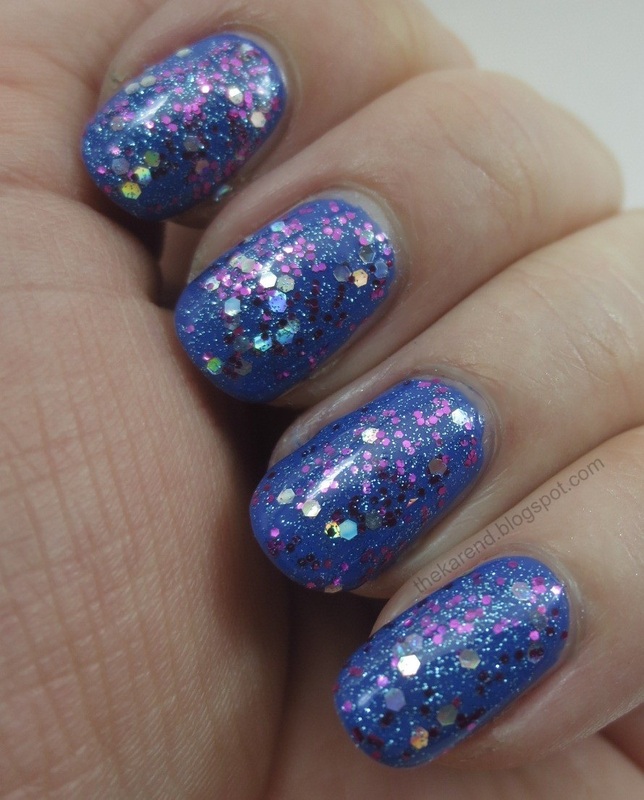 It's got a mix of fine silvery blue glitter, small magenta hexes, and medium sized silver holo hexes in a clear base. I put two coats of Grape Shifter over In Prompt Blue. I also added topcoat, though Grape Shifter is not especially bumpy. The "Shifter" part of the name is quite apt, as the holo hexes change colors quite readily. 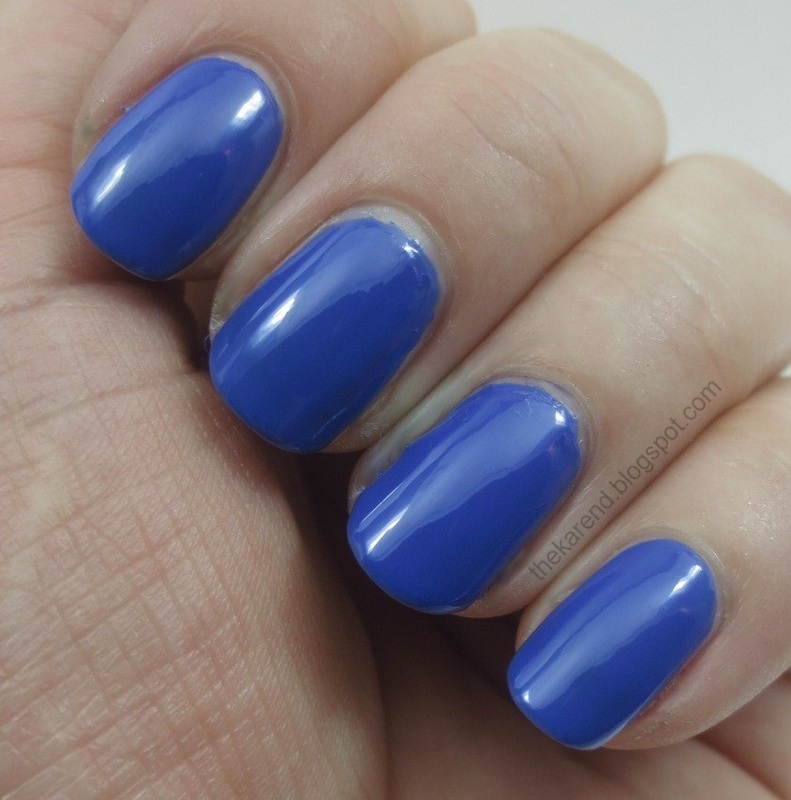 In Prompt Blue looked like it might stain, but it came off cleanly even though I had no basecoat on. Granted, I didn't have it on my nails all that long, but I have had blues stain in less time, and this one didn't. I thought In Prompt Blue was the most compatible base for Grape Shifter of all the colors from this display, but I went ahead and tried it over some of the others just to see. 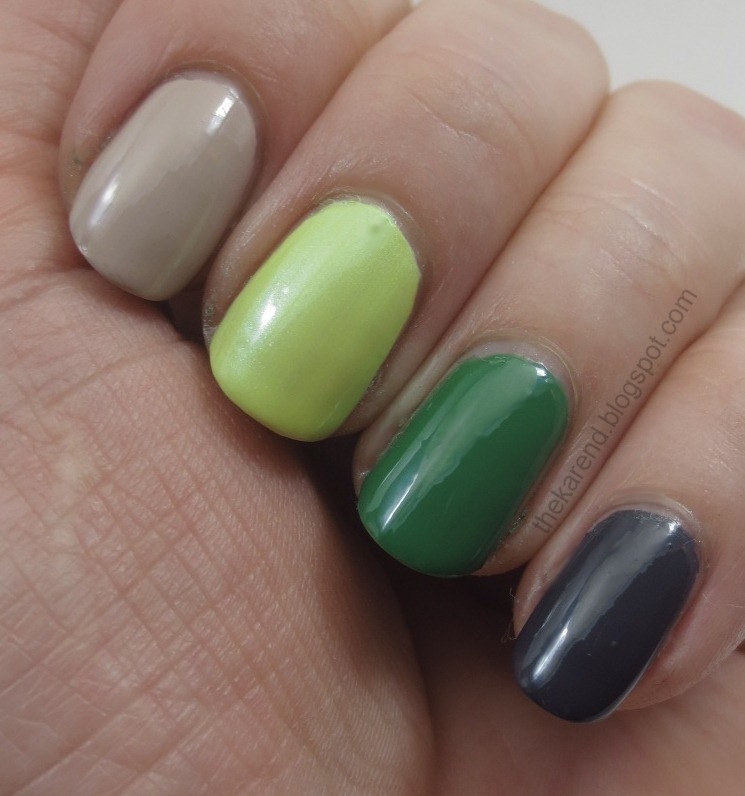 Below from top, 2 coats of Grape Shifter over Chartreuse Chase, Go for Gold, I-rush Luck, and Grease Lightening. And then sure, why not matte-ify since Sally Hansen was nice enough to make the Big Matte Top Coat. I think I like these combos better matte, actually. 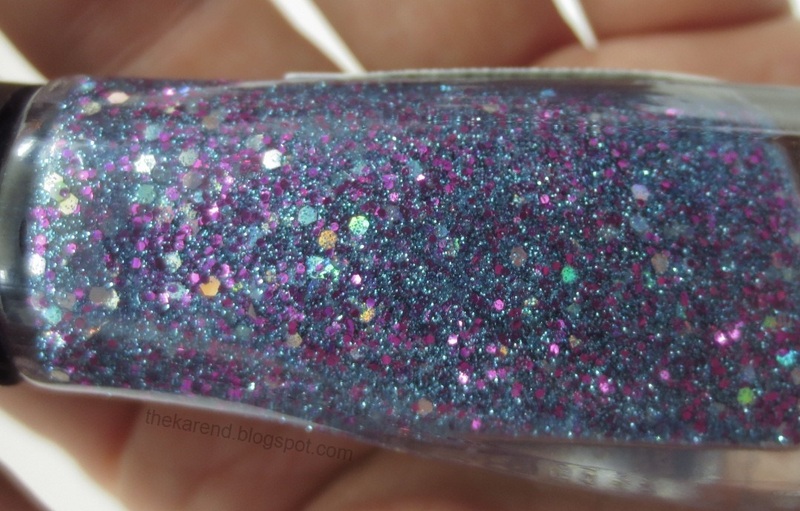 Most of these shades are similar to (if not the same as) colors I already have, but the cremes are nicely opaque and the glitter coordinates well with my favorite cool colors. I wish Chartreuse Chase were more pigmented though it is a very interesting color. What are your thoughts? See anything that calls to you? 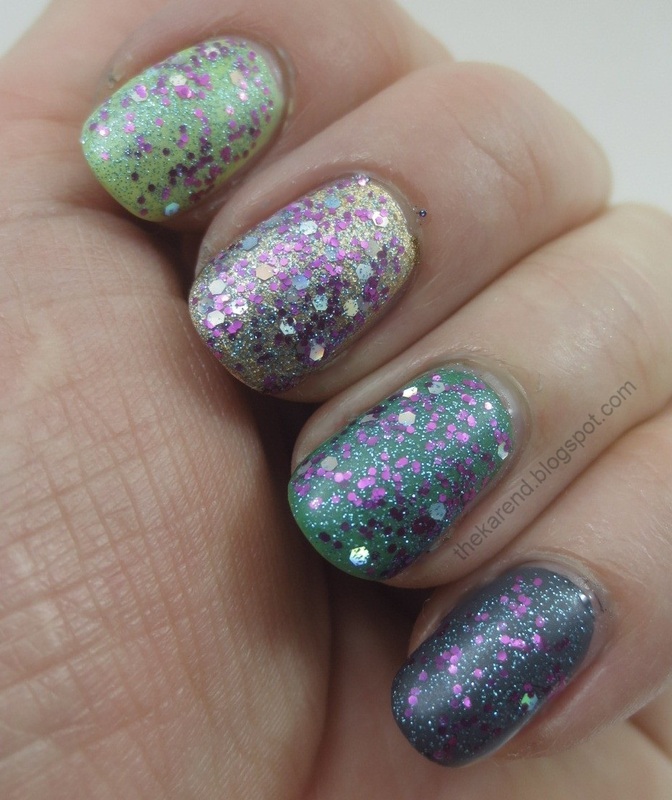 I mattified some random glitter that I was wearing the other day, and I also liked the results. I am definitely going to be trying that again. Hi dear Karen, I really like the first manicure, green and gold are so classy together!!! I really like all the shades! Grape shifter is actually really appealing to me. I'm not normally that fond of purple anything! 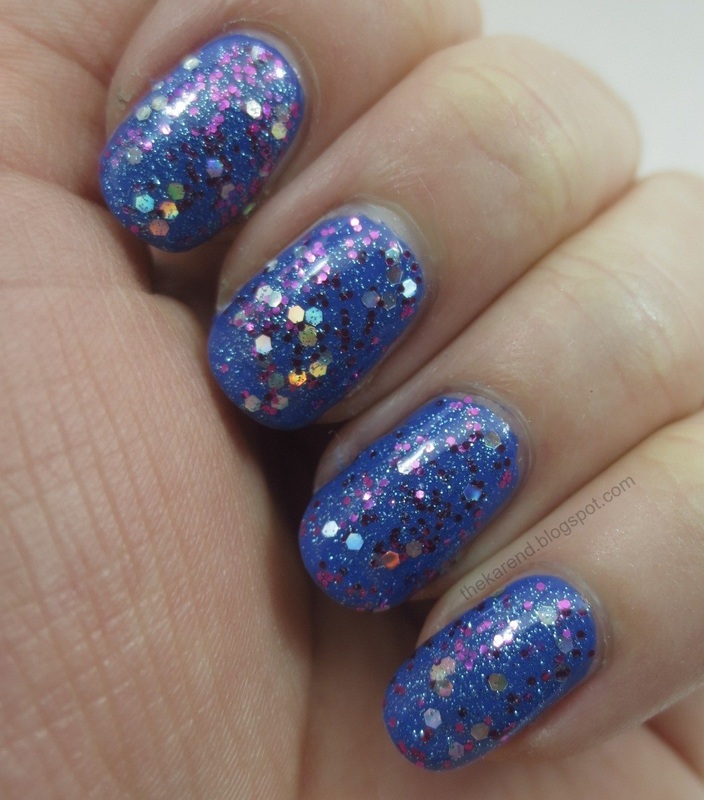 Ooooh, I'm obsessed with that glitter! I really like the gold French tips over that pretty green -:) ! !